Your scenes contain the animation sequences you are working with, which allows you to manipulate them and their associated files to achieve the desired effect. • Make sure no one else is currently using the scene's data. Failure to do this may result in file corruption and loss of your work. • Wait until everyone is offline. This ensures no one can open the data files while you move them. • Wait until everyone is offline. This ensures no one can open the scene while you rename it. The Change Stage command allows you to change the approval stage name of a selected scene that is in Manual approval mode. You can also create customized approval stages that reflect the approval process in your production environment. A scene's stage is a method of tracking its progress in your production; the scene's current stage does not stop you from advancing the scene to other stages. Changing a scene's stage and making manual approvals allows you to assign and change a scene's approval stages to keep track of its current status. For example, if you have a scene whose drawings are being scanned, you will mark it as the Scan stage. After you begin adding colour to these line drawings, you can change the scene's stage to Paint. If the selected scene has an automatic approval policy, the Change Stage command will be inactive in the Scene menu. To change a scene's stage, you must ensure that the approval policy is set to Manual. If you must restart a scene from scratch, you can completely erase a scene's exposure sheet. When you clear a scene, you delete all exposure sheet database information and reset the scene as if it were completely new. You are only deleting the files from the database; the Control Center module does not actually delete any image files (drawings, scan, final frames). If you have questions concerning the contents of a scene, you should contact the technical director responsible for the scene in question. The Copy command lets you copy an existing exposure sheet from one scene into another scene. You can then modify the copied exposure sheet using Harmony Stage. When you are ready to send a set of scenes for rendering, you can use the Send to Rendering command. This command allows you to send one or more scenes for rendering to the Batch Processing machine. You can also use Harmony Stageto render scenes, but since you must open each scene individually in Harmony Stage, you can only send one scene to render at a time. 1. In the Scenes section, select the scenes you want to move. 2. From the Settings menu, select Modify > Move. 3. In the Move Scenes list, select the filesystem where you want to move the scene. If the directory to where you want to move the scenes does not appear in the list, enter the new directory path in the Filesystem field. The Cloud module automatically checks the amount of free space for each directory and compares it to the size of the scene you want to move. If there is not enough disk space on a particular drive/mount point to store the scene, the directory displays a "not enough space" message. If there is not enough space on a particular disk, you should choose another disk from the list. 2. In the Settings menu, select Modify > Rename. 3. In the Name field, type the new name for the scene and click Save. Try to keep scene names brief. It is recommended that you use no more than 23 characters. Use lowercase letters if these scenes may be used with a Windows workstation. 1. Select the environment, job and scene you want to prioritize. 2. In the Settings menu, select Modify > Change Priority. The Edit Scene dialog box appears. 3. Drag the slider to the desired priority (0 means the job has the highest priority for processing through the Vectorize or Render queue and a Job with a priority of 10 is the least important). 1. In the Scenes section, select a scene. 2. From the Settings menu, select Modify > Change Stage. The Change Scene Stage dialog box appears. The current stage of the selected scene appears in the From Stage field. 3. Select the stage you want to apply to the current scene from the To Stage menu. 2. From the Settings menu, select Modify > Reorder. 4. Once the scenes are ordered, click the OK.
2. From the Settings menu, select Modify > Clear. The Clear Scene dialog box appears. 3. Click OK to clear the data from the scene. 1. Select the scene you want to copy. 3. Select the environment, job, and scene you want to copy to the selected exposure sheet. 4. If you want to copy the associated animation data files with the scene's exposure sheet, select the Copy All Data option. Harmony will place a copy of the animation data in the target scene's storage directory. 6. If the scene you are copying already has an exposure sheet, a Confirm dialog box appears to make sure you want to replace the existing exposure sheet. 1. Select the environment, job and scenes you want to send to the Render queue. 2. From the Settings menu, select Batch > Send to Rendering. The Render Scene dialog box appears. 3. In the Range section, select the frames to render. ‣ All Frames: Sends all the frames in the scene to be rendered. 4. To split the frames into sets of frames, select the Chunk option. In the Size (Frames) field, enter the number of frames you want in each chunk. 5. In the Resolution section, set the resolution of the scene you want to render, either by name or size (value). 6. 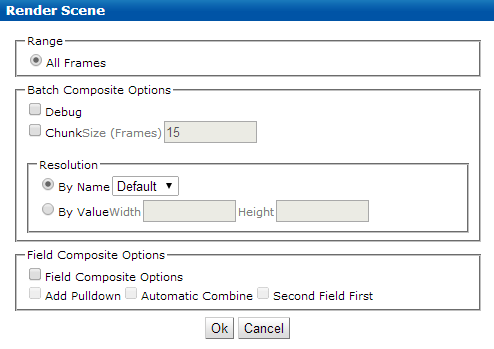 In the Field Composite section, select the Field Composite Option option to refine your selection. ‣ Add Pulldown: Uses the 3:2 pulldown technique. ‣ Automatic Combine: Combines even and odd fields on a scene's image. ‣ Second Field First: Always starts with the second field before combining with the first field. 8. To verify that the scenes have been sent for rendering, you can display the Render queue. 1. Select the environment, job and scenes to send to the Vectorize queue. 2. From the Settings menu, select Batch > Send to Vectorize. The Send to Vectorize dialog box appears. 1. Select the environment, job and scenes to unvectorize. 2. From the Settings menu, select Batch > Send to Unvectorize. 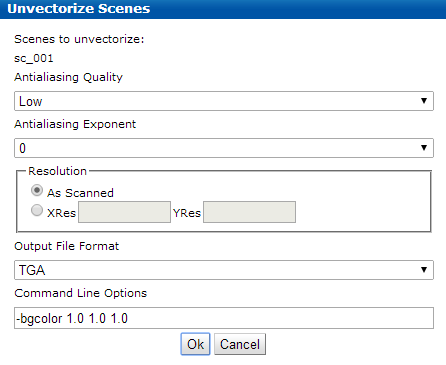 The Unvectorize Scenes dialog box appears. 3. Antialiasing Quality: Select the Antialiasing Quality and Antialiasing Exponent. 4. Resolution: Set the resolution to be as it was originally scanned (selected DPI value during the scan process) or a specific width and height in pixels. 5. Output File Format: Select the output file format for your final bitmap images. 6. Command Line Options: Enter additional parameters.